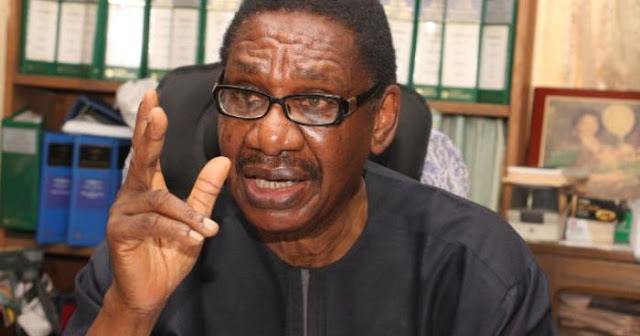 Chairman of the Presidential Advisory committee against corruption, Prof. Itse Sagay(SAN) has asked banks to ignore the order by the House of Representatives panel to unfreeze bank accounts belonging to former first lady, Mrs. Patience Jonathan. The House of Representatives committee on Public petitions had on Tuesday issued an order to all six banks to unfreeze accounts belonging to Mrs. Jonathan. According to the committee, the freezing was carried out with no specific orders from any competent court of law. The affected banks were: Union Bank, First Bank, EcoBank, Diamond Bank, Fidelity Bank and Skye Bank. Sagay, in his reaction, pointed out that the could not unfreeze an account frozen by EFCC or a court. “The House of Representatives is acting totally outside of its functions and constitutional rights. It is trying to take over a court. Only a court higher than the High Court which froze the accounts can say they should be unfrozen. The EFCC has the power to temporarily freeze an account and then obtain a court order. Normally what the EFCC does is to flag such accounts and then get a court order and I am sure they are in the process of that. So, I think we should just ignore the vituperations of the House of Representatives which seems to have lost sense of its true functions and is now delving into a judicial work,”.